The FLIPR® Potassium Assay Kit measures functional activity of ligand- and voltage-gated potassium channels.The homogeneous, no-wash assay protocol provides a large signal window and high Z’ values. The FLIPR Potassium Assay Kit exploits the permeability of thallium ions (Tl+) through both voltage- and ligand-gated potassium (K+) channels. 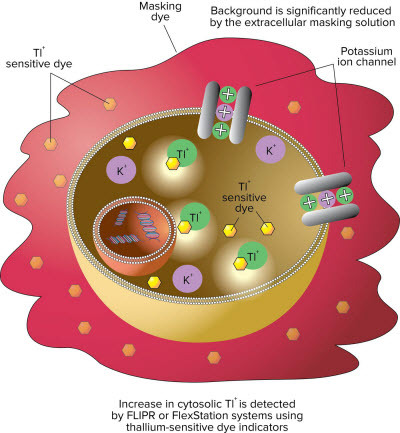 In this assay, a novel, highly-sensitive Tl+ indicator dye is utilized which produces a bright fluorescent signal upon the binding to Tl+ conducted through potassium channels. The intensity of the Tl+ signal is proportional to the number of potassium channels in the open state; therefore it provides a functional indication of the potassium channel activities. In addition, one of our proprietary masking dyes is employed to further reduce background fluorescence for improved signal/noise ratio. 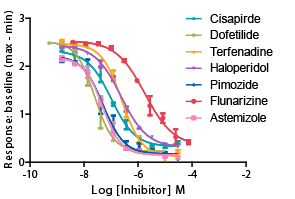 Figure 1: Comparison of FLIPR Potassium Assay Kit results to a competitor kit. 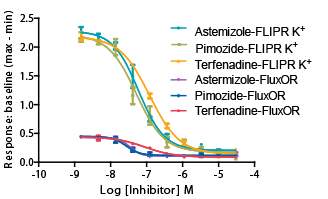 Figure 2: Comparison of signal dynamic range between the FLIPR Potassium Assay Kit and a competitor kit. Negative control is 4 μM terfenadine; positive control is buffer. 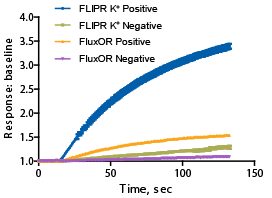 The Z’ factor for the FLIPR Potassium Assay Kit = 0.85 and n = 32 compared to the competitor Z’ factor = 0.64 and n = 30. Figure 3: Concentration-dependent inhibition of hERG channel by reference compounds. Figure 4: Optimization of hERG channel stimulant. Cells were incubated with dye and the stimulant buffers were added during detection on the FLIPR Tetra System. The concentration-dependent response of signal was characterized under different conditions. Optimal signal was obtained from the combination of 1 mM Tl+ and 10 mM K+ (final concentration) stimulant buffer diluted in chloride-free buffer. Figure 1: The assay exploits the permeability of thallium (Tl+) for potassium (K+) channels. The cells are incubated with an AM ester form of a fluorescent thallium sensitive dye. Intracellular esterases cleave off the AM group trapping the dye within the cells. Cells are then stimulated with either a mixture of K+ and Tl+ or a ligand in the presence of Tl+. The increase in fluorescent signal represents the influx of Tl+ into the cell specifically through the potassium channel and becomes a measure of potassium channel functional activity. Background is reduced by the masking solution.